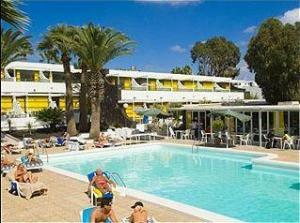 Address: Calle Tanausu, 1, Puerto del Carmen (Lanzarote), Islas Canarias. Just 25 m from the golden beach, these cheerful apartments have an outdoor pool and are set in exotic gardens – complement your holiday with great buffet meals in the restaurant. Enjoy your own private space in which to spend your holiday in Lanzarote at your own pace. The Arena Dorada’s apartments are decorated in colours that reflect their island setting with yellows and aquamarine blues in both the artwork and the furnishings. Each Arena Dorada Apartment boasts a private terrace looking out onto the garden or island, where you can sit and enjoy a refreshing drink. The Arena Dorada apartments and studios are set within 7,800 m² of exotic gardens. You can enjoy an afternoon siesta or read your book in the shade of the palms and pretty plants. Cool off in the outdoor pool or with a refreshing drink from the poolside bar. Dine in the fantastic buffet restaurant which serves dishes typical of Lanzarote as well as international cuisine. In the evening, head to the bar for a relaxing drink among friends. Please inform Apartamentos Arena Dorada in advance of your expected arrival time. You can use the Special Requests box when booking, or contact the property directly with the contact details provided in your confirmation. Please note that once the guest has checked in and paid for the stay, a refund will not be given in the case of early check-out.